26th December: Christmas is always a poignant time for people who have lost loved ones. 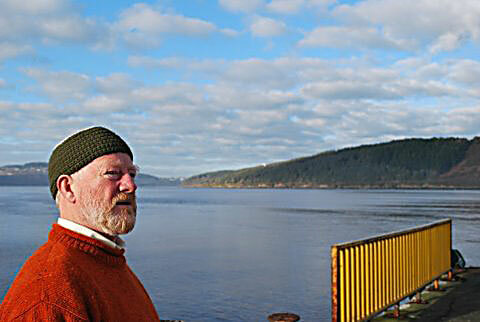 We remember our own two absent friends, John Quann and Michael Hearne, who sadly left us for the Unknown Voyage in 2006. We remember them now for their company and the great times we had together. 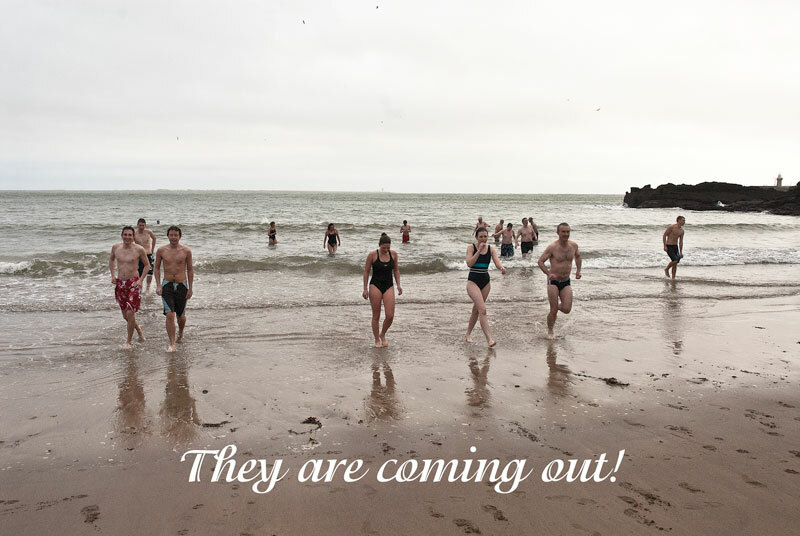 The Sixth Annual Michael Hearne Memorial Swim was held today, St Stephens's Day, Monday 26th December 2011 at Lawlor's Beach, Dunmore East and the proceeds were in aid of the Solas Centre Cancer Foundation. 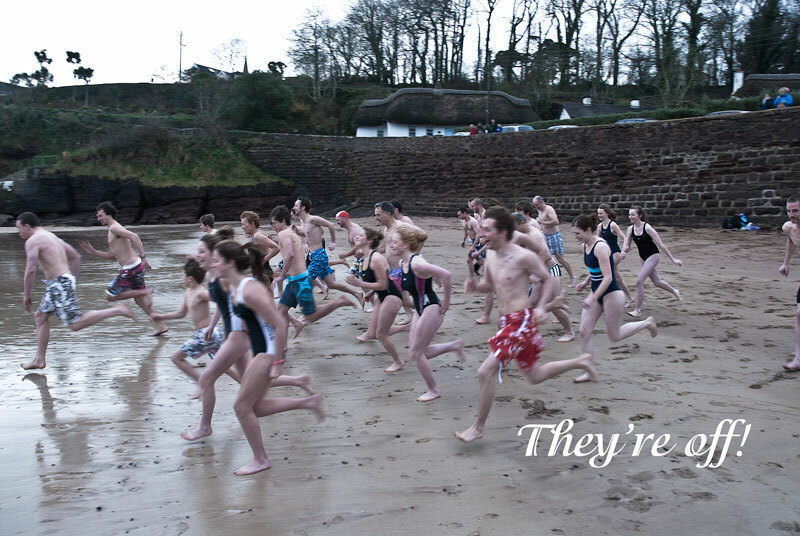 45 swimmers took the plunge in cloudy conditions but it was reasonably mild at ten degrees. Some of the crew were there too and there were a good number of family and friends of Michael there to watch the proceedings. 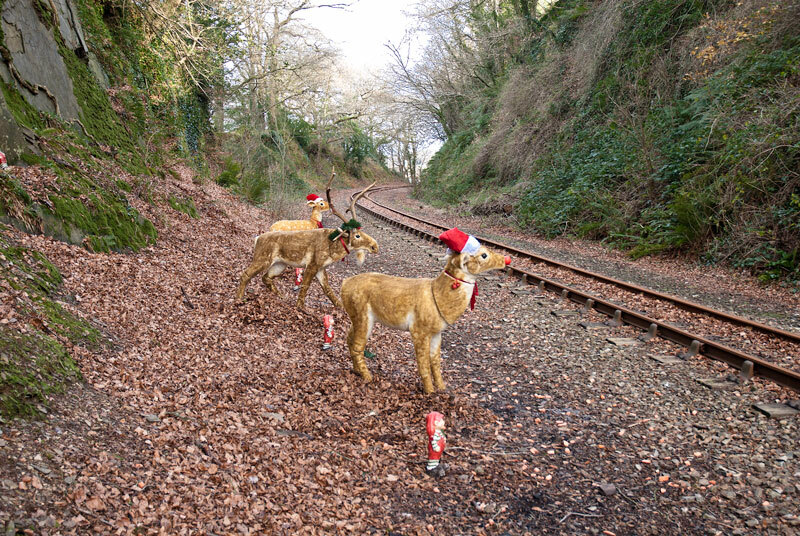 22 Dec: If you are looking forward to a walk out at the Minaun and the fine views now afforded of the Mighty Suir, you might also consider a walk along the railway line at Mount Congreve. 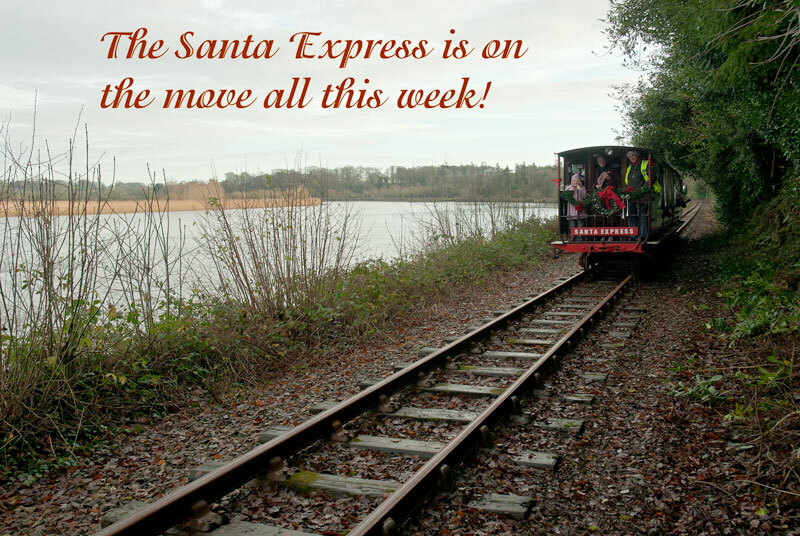 And if you do so this week, when the weather is mild and pleasant and the views of the Suir are equally superb, you might also see the Santa Express in full flight carrying young and old on a wondrous journey through high trees, over ancient bridges and along the edge of the Mighty Suir, and all to see Rudolph and two of his assistants as they prepare for the long journey ahead of them over the next few days. A fine journey indeed. Aye! 18th December: What’s the connection between the Tower of London, the Owen brothers and the Metal Man at Tramore? Well, John and Robert Owen were Royal Gunfounders, appointed by none other than Henry VIII in 1546 (a year before the bauld Henry died). The Owen brothers, by all accounts were the cream of the gunfounders and their cannons were in great demand because they were so well made. And the Owen guns were used in thebest ships of the time. The surprising thing is that only around 10 of the many guns that they made during their lifetimes survive. At least three of their guns were on a Tudor warship that foundered off Great Newtown Head in 1566. Two of these guns were sakers that were around three metres long and another was a falcon at around two metres. The so called sakers are the largest of all of the Owen guns and those that were on the brigantine that was lost under the site of the Metal Man were passed by the Owen brothers during the reign of Edward VI, Henry VIII’s successor.Of course, the Metal Man, wasn't even there when she went down; (he was erected in 1823, over 250 years later). However he was there when two of these guns were almost certainly salvaged beneath him between 1970 and 1972. It appears that these two cannon were smuggled to Britain in the early seventies by British treasure hunters who raised them off the seabed at Tramore using a trawler with strong lifting gear that they hired at Dunmore East. They were driven in a camper van on a ferry from Rosslare to Britain. They were later bought by an official from the Tower of London at a garage in Essex in November 1972. The two Tramore cannon are now on display in the Tower of London and are seen by thousands of people annually. However, The Tower of London have always been coy about the origin of the two cannon and the display plaque on the guns state that they were “removed from an unidentified wreck off the Irish coast”. In 1976, another Tudor cannon was salvaged under the nose of the Metal Man. It too was an Owen gun, in good condition, but, apparently, no one in Ireland had any interest in acquiring this gun. This gun disappeared and no trace of it has been seen since, though one very similar to it was put up for auction in September 1980 and was bought by a private collector. So now you know of the connection between the Tower of London, the Owen brothers and the Metal Man at Tramore. He has seen a lot, our Metal Man! In case you don't know it, the Metal Man stands guard on one of three pillars on the west side of Tramore Bay and whose purpose was to warn off shipping from entering Tramore Bay. If they did so, they rarely got back out again, expecially in rough weather. 10th December: The constant action of the waves on hard structures around our coasts inevitably causes deterioration of those structures as the waves relentlessly impact on them and with a ferocity in winter that would destabilise any structure, no matter how well it is built. 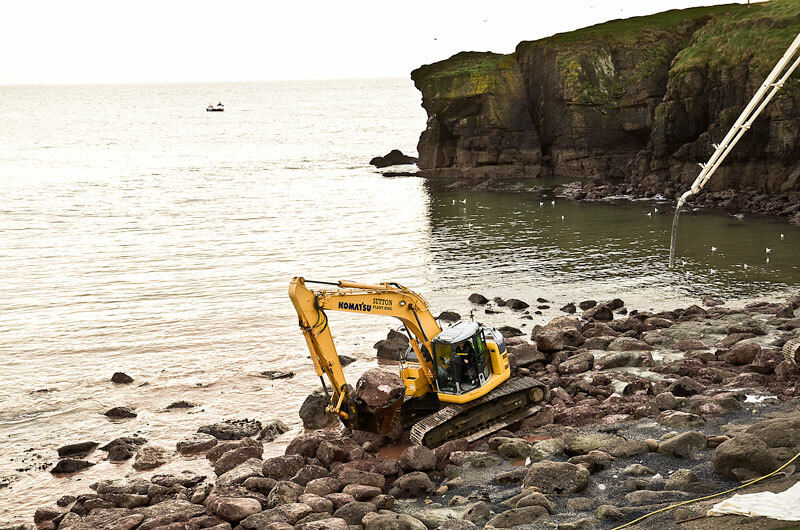 Time takes its toll along the coast and remedial action is always required. 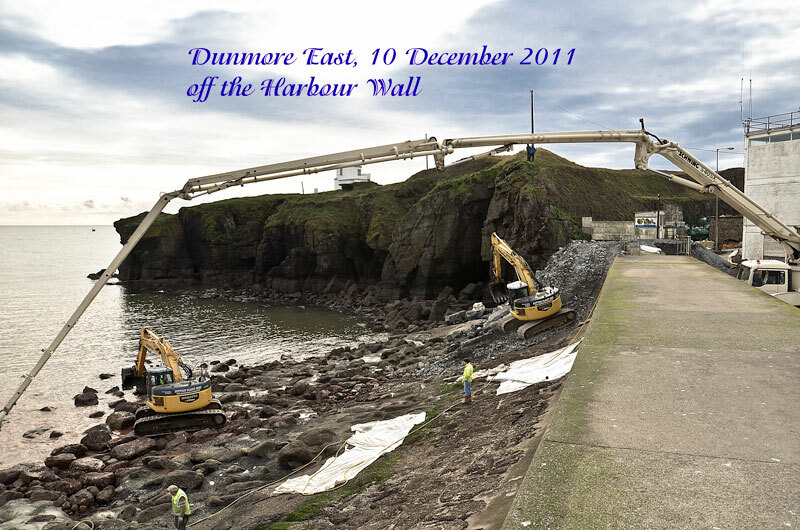 There was great activity in Dunmore East this morning (Saturday 10 December) as the contractors took advantage of calm conditions and suitable tides (there are big drains on the tide this weekend) to reinforce the seawall at the Harbour and specifically the interstices between the boulders just off the wall, which are the first line of defence to protect the wall itself. 4th December: What does John Tyrell & Sons of Arklow and Well Boy! have in common. Well, John Tyrell & sons were boatbuilders in Arklow (they who built the Asgard II no less) and Well Boy is a local phrase here in Waterford, used whenever you meet someone. But it is also the name of the local river rescue boat, also named Wellboy. It was built in Arklow by the Tyrells in 1980 and operated as a pilot boat by Dublin Port on the Liffey. It was purchased by Waterford City River Rescue and converted to a base station in 2010. Waterford City Rescue operates 24 hours a day, 7 days a week between Mount Congreve and Cheekpoint providing a valuable river rescue service on the Suir. 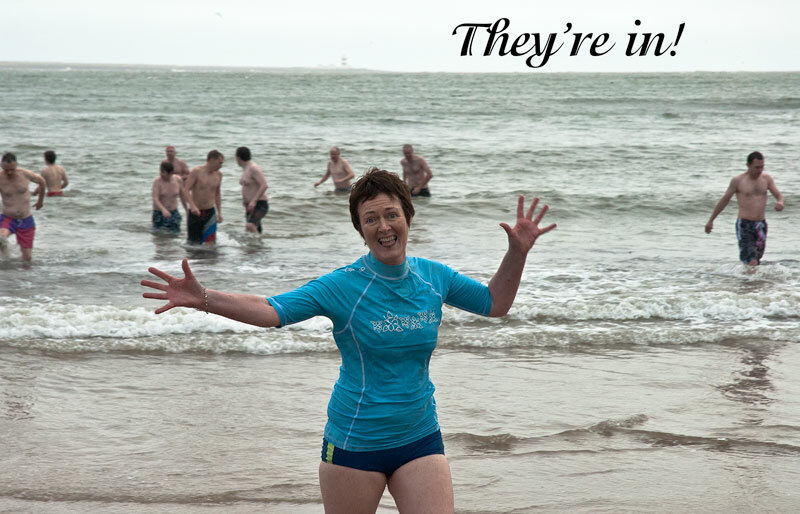 They are funded by the voluntary contributions of the people of Waterford. Wellboy is permanently moored on the Quay in Waterford at the Marina, opposite the GPO. Waterford City Rescue were upgraded to a declared facility of the Irish Coast Guard in June 2011. Well done and keep up the good work! 27th November: Isn't it wonderful to see and abundance of fish around our shores, and this is the time of year that the herring spawn off the Waterford coast and the boats head out from Dunmore East in search of them. And it is great to see them returning with their holds full and the quayside heaving with activity. Mind you it probably never will be as busy as it was in the '70s, and a quota might be fished out in a day or two. But it is nice to see all the same. The photographs were taken on a glorious day in late November. It is easy too to see why the whales are also congregating offshore to feast on the 'silver darlings'. 20th November: A book recently published with the title Glorious Galway, Hookers, Currachs, Lake and River Boats, would make a lovely Christmas present. It is a hardback book, 182 pages long, and packed with information, maps and photographs of all the various boats that grace the Galway coastline. It is also bilingual, so you can read in either Irish or English. The book is reasonably priced at €25 and should be available in local booksops, or, if outside Ireland, online at kennys.ie. Enjoy! 14th November : What a day it was on Sunday the 6th November! It was great to out and about and within sight of the sea, and not a boat to be seen, though the calm seas off the Waterford coast provided the whale watchers with ideal conditions, with killer whales and bottlenosed dolphins off Clonea, common porpoises off Helvick and Brownstown and a fin whale off Helvick and Ardmore, all great leviathans of the sea. AutumnWatch on BBC2 on Friday 11th November showed spectacular images of Fin Whales off Mine Head, Co Waterford, recorded on Monday 7th November 2011. And the fin whales were still about west Waterford on the 12th November with 4 off Mine Head and 1 off Clonea beach. So Waterford is the place to be in November, if you want to watch whales. 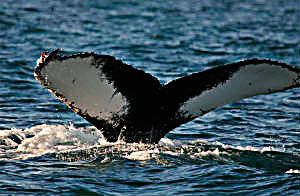 We'll have to add another whaling song to our repertoire (Rolling Down to Old Mauui, we already have: sorry Timmy!). 29 October: One crew member and his dear wife Cecily were at a wedding recently in west Cork on what was a beautifully clear day. The Fastnet Rock was unusually scenic in the calm seas and warm sunshine. What a place to be! 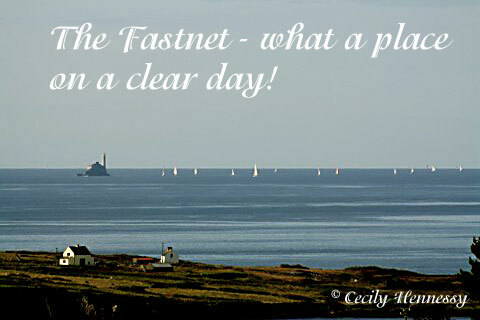 As everyone should know, The Fastnet is the most southerly point in Ireland and is around 8 miles off the Irish coast. it is rarely as serene as depicted in the above photograph. 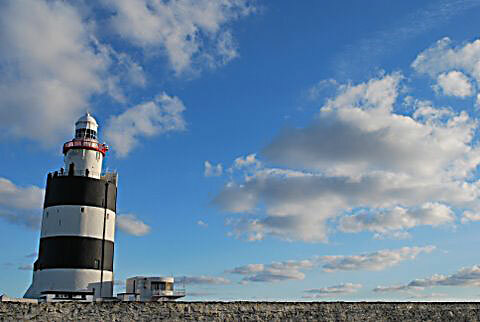 More usually, especially at this time of year, The Fastnet is lashed by wind, waves and high seas. And when the waves are high there, they are high. It first began beaming light in 1854 and is the turning point on the annual Fastnet Race from Cowes in England, a 700 mile race across what are often strormy seas, even in August, when the race is held. In 1979, a severe storm during the race resulted in the loss of several yachts and there were 15 fatalities. There was another spectacular incident there this year, in heavy fog and high seas, when the keel of a super yacht snapped. Luckily there was no loss of life and the entire crew of the 100-ft yacht, Rambler 100, were rescued, five of them after spending nearly 3 hours in the rough seas. A great ending to what could have been another disaster. 15 Oct: If you go down to the sea, well you never know what you might see, and there is always something of interest. Who would ever think that mooring bollards would have an intrinsic interest, especially when they are locally crafted to be used locally. 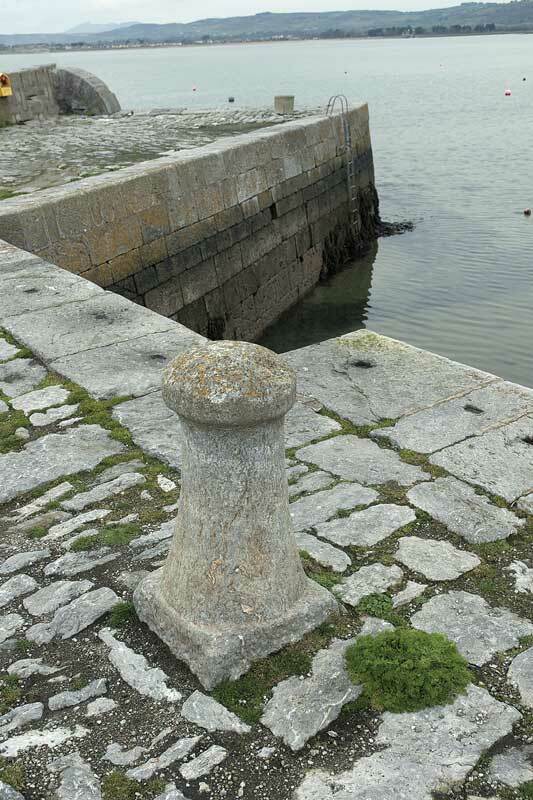 Look at the images above: the cut-stone bollards at Ballynacourty (on the east side of Dungarvan Bay near the Gold Coast Hotel) are things of beauty. Look at how well-made they are and functional too (though they are less used now than when this limestone pier was first built around 1832). 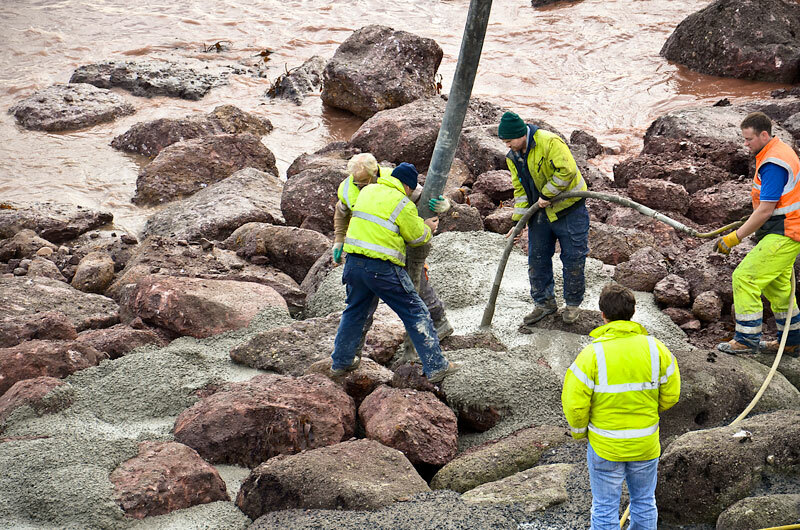 And what about the stone cobbling on the pier. A very unusual feature, especially since cobbling like this is now rarerly used, and is even (God forbid) removed in some areas. 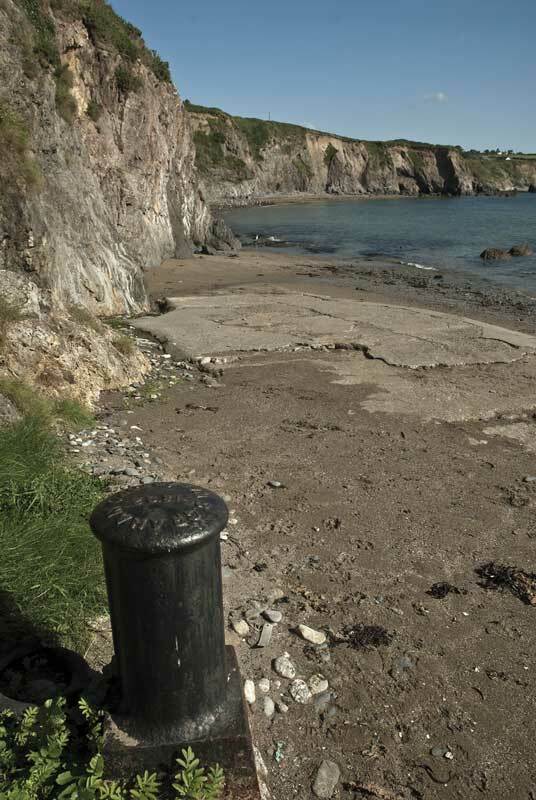 Totally different are the metal bollards, seen here at Dungarvan (the left photo) and at Boatstrand (on the right), which is on the Waterford coast midway between Dungarvan and Tramore).Tthe interesting thing about these is that they were made in Waterford by Grahams around 1894. Does anyone remember them? 7 October: Isn't it great to hear that our European neighbours are still investing in the seas around them, even if they have less sea frontage than we have here in Ireland. To great fanfare, the latest Tall Ship to grace the worlds oceans, the Alexander von Humboldt II, was launched in Germany on the 24th of September 2011 at Bremerhaven, a place we in Hooks and Crookes know well, having spent an enjoyable afternoon there among all the boats a few years ago when we sang at the Bremen Maritime Festival. 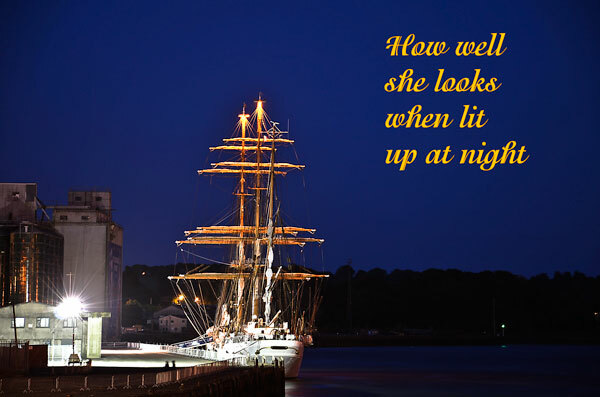 Launched too late for our Tall Ships Festival in July, maybe we will see her in Waterford when the Tall Ships next visit our noble City. She will be a great addition to the sail training fraternity. In the meantime, fair sailing among the waves. 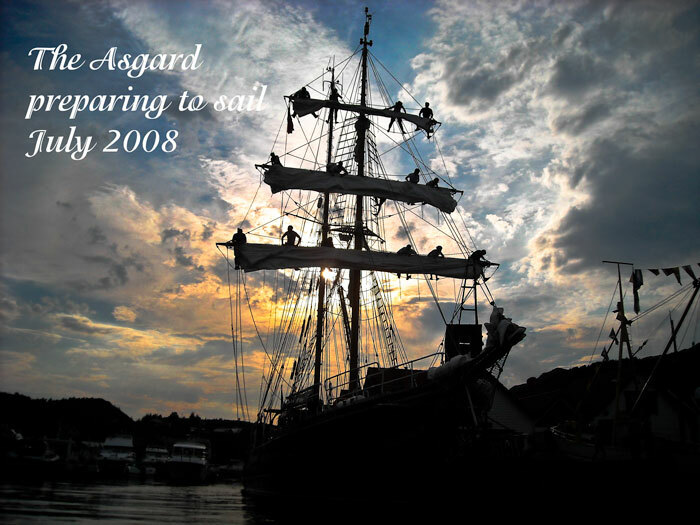 9th September: Sunday 11th September is a very special day in Irish Maritime History as it was on this day three years ago that the Irish Sail Training Asgard II sank in the Bay of Biscay. We in Hooks and Crookes have tried to keep her memory alive by various updates over the years on this web site.The only radio documentary about the sinking itself was made by DCU student Stephen Long, (yes a son of our own Captain). Stephen has a particular affinity with the Asgard as he was one of the sail trainees onboard as she sailed out of Dublin for the last time in July 2008 to participate in the Tall Ships Race. In his documentary, some crew members who were onboard the night of the sinking talk in public for the first time about their experiences. 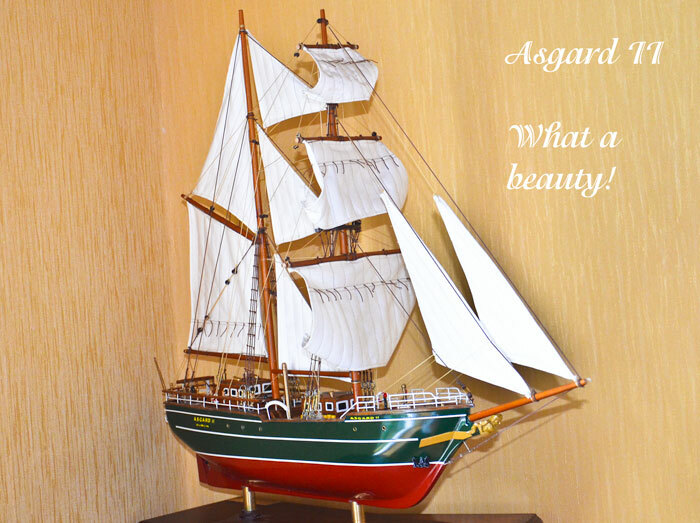 The documentary can be heard here: Although the Asgard is now at the bottom of the sea, there are many great photographs of her in full sail, (we used one as on the cover of out recent Songs of the Tall Ships CD) though there are very few scale models in existence. 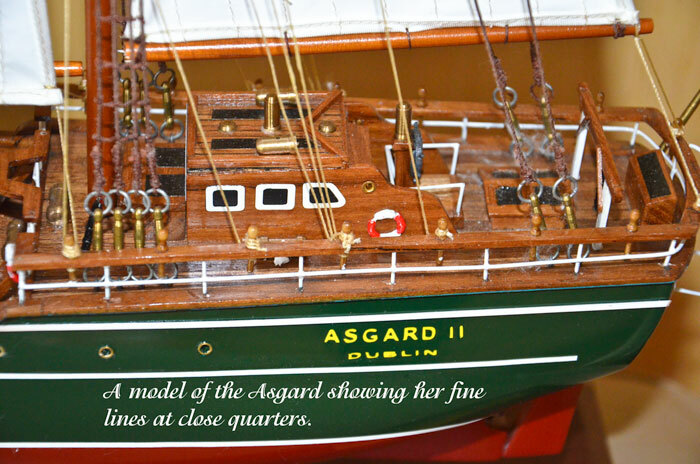 However the same Captain Long, acquired one such model of the Asgard recently. The detail in this model is fantastic (don't worry he did not build it himself) as shown in the above photographs. 3rd September: Didn't the Tenacious look well on the Waterford Quay at high tide, beautifully lit up to complement the lights of the many shopfronts. She is one of two Tall Ships run by the Jubilee Sailing Trust (both ships are capable of accomodating people of all physical abilities). 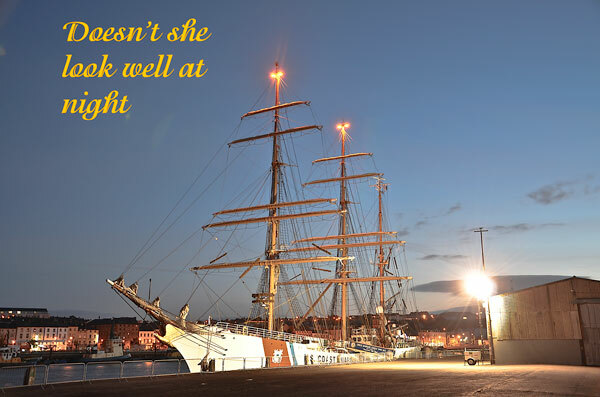 She is a regular visitor to Waterford. Less spectacular but equally beautiful was the smaller Amazon, that also arrived on the 2nd September. The Tenacious left on the morning tide on the 3rd September. Aye. 4th August: Waterford has a long maritime tradition, with a tremendous history of shipbuilding, ships and boats associated with Waterford Harbour and the mighty Suir. 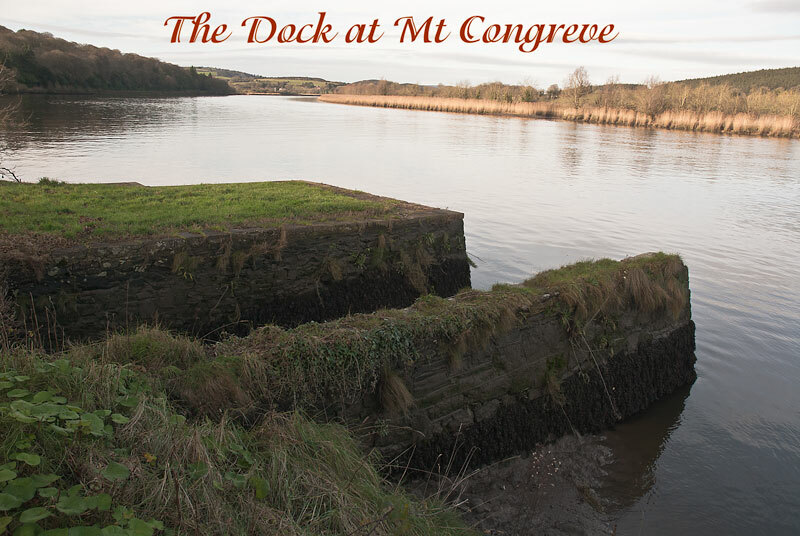 The Suir was a great conduit for all this maritime activity as men and boats constantly plied its often fiery waters, trading with other ports around Ireland, Europe and the World. Indeed many of the sons and daughters of the City and its hinterland left our shores for foreign lands to fish and to work, and, sadly, many who emigrated during hard times in this country never returned, and finished out their days in distant places, far from the green shores of their birth. Little of this long and turbulent maritime history is obvious in Waterford City, and there are few features to remind the present citizens of the City of the trials and tribulations of previous generations and the hive of activity that once prevailed along the majestic Waterford Quays.What a pity it is that the Suir in the City is now largely a dormant workplace, with only the comings and goings of pleasure craft to be seen occasionally. The visit of the Tall Ships to our lovely City at the end of July was a reminder of what it used to be in the days of sail when schooners, square-riggers and boats of all shapes and sizes berthed and worked along the Quay.Now however, a simple but effective monument has been erected to commemorate the maritime history of Waterford City. 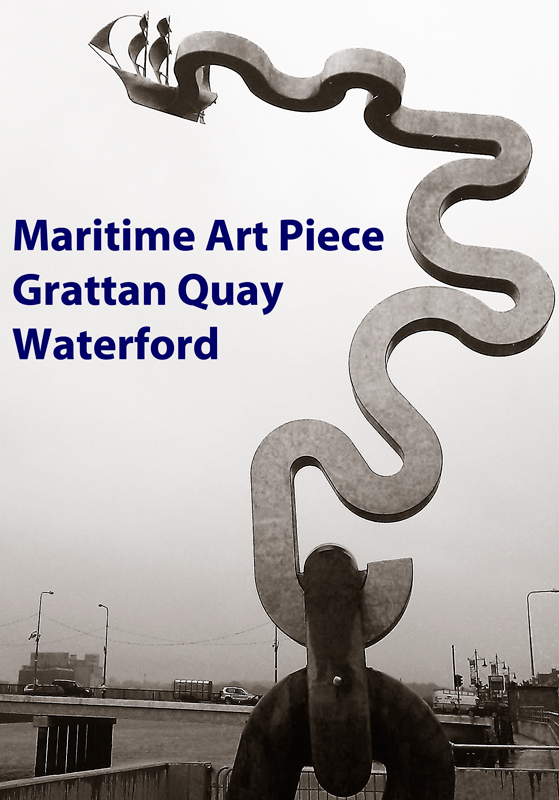 This piece is positioned on Grattan Quay above Waterford Bridge, somewhat removed perhaps from where all the activity was centered but it is nevertheless a welcome attraction. Maybe it is the first of many monuments that will celebrate our rich maritime heritage. 3rd August: The Suir is a mighty river, of that there is no doubt. 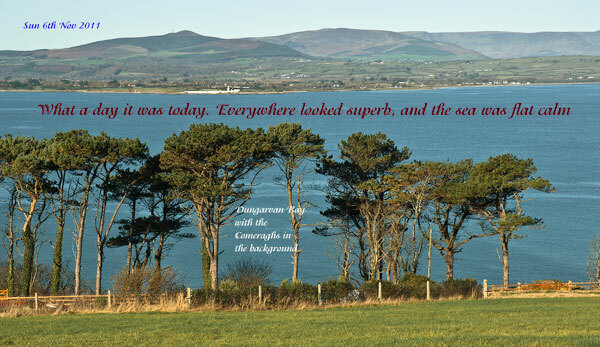 It is always wide around Waterford City and is it deep in places. How ever it is shallow too in other places, especially on low spring tides and many's a boat has ran aground, especially if the captain is unfamiliar with the tides, the currents and the depths, as happened for example on the 4th August when a small Norwegian sailing vessel ran aground off the Island. Presumably, visiting craft are advised of these dangers. Luckily, most of the shallow areas are muddy and craft easily lift off on a rising tide without damage. 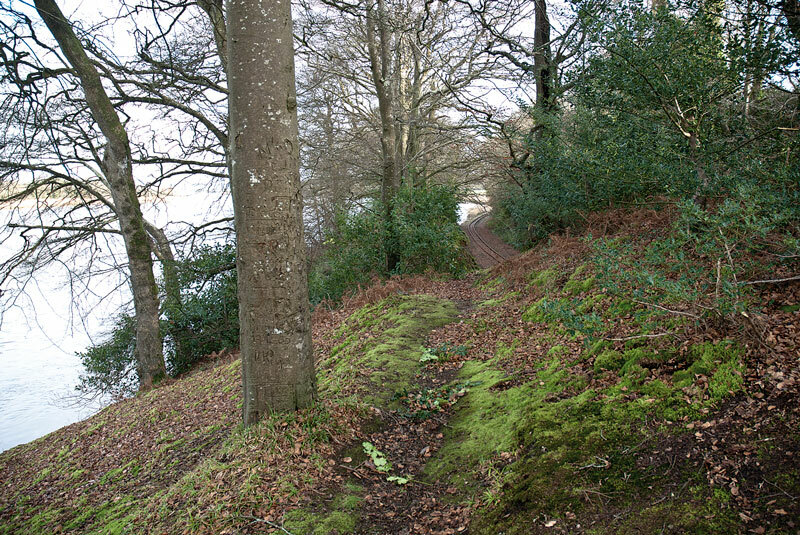 But other areas, on the western shore of King's Channel opposite the Castle are quite rocky, and this would be a dangerous area to run aground. 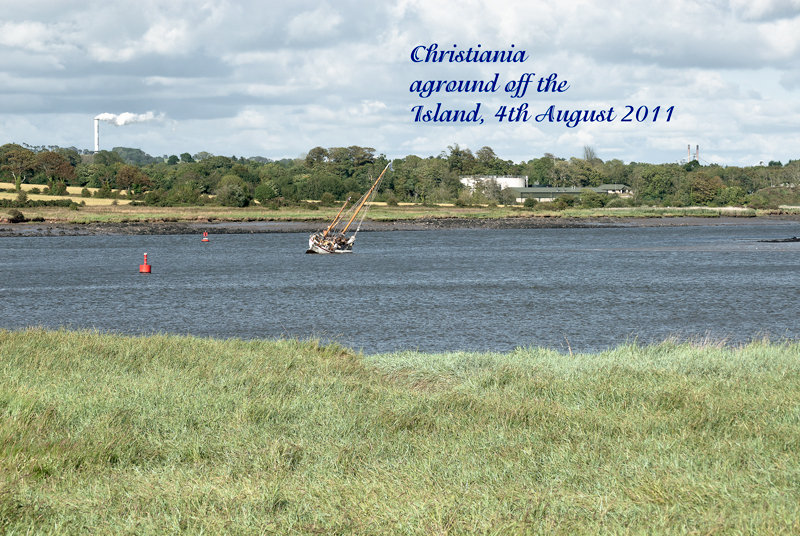 For the record, the Christiana refloated successfully and sailed upriver initially at 7 pm and then probably left for Dunmore (low tide was around 5). 3rd August: The Waterford City Development Plan has to be revised to cover the period 2013-2109 and the process of drafting the new Plan has begun. Waterford City Council are now inviting submissions and they ask you to read the document, which they have placed on their website, and then to make a submission on how you feel the City should be developed during the period of the new plan. Why would you bother, I hear you ask. Well, the rich maritime heritage of the City and the impact of the Suir over the generations is now, arguably, neglected. So why not ask that this be remedied, perhaps in the presence of more maritime art along the Quay (see below), or even the incorporation of an interpretative centre in the Museum of Treasures which would outline the maritime heritage of the City. What about Sail Training? Should the City make a pitch for a National Sail Training Centre to be based in Waterford City. 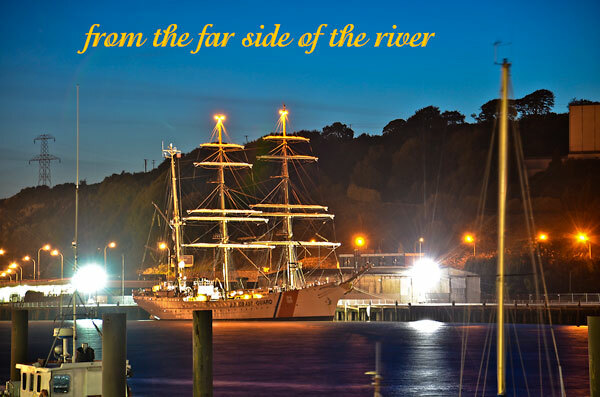 How nice it would be to see a new national sail training vessel berthed along the Quay and active forever in the Suir? So now is your chance. Read the document and submit proposals to explain, interpret and advance the maritime heritage of the City. There is only one problem: the deadline for submissions for this the preliminary stage is the 5th August 2011. However there will be further opportunities for submissions in later stages of the process. 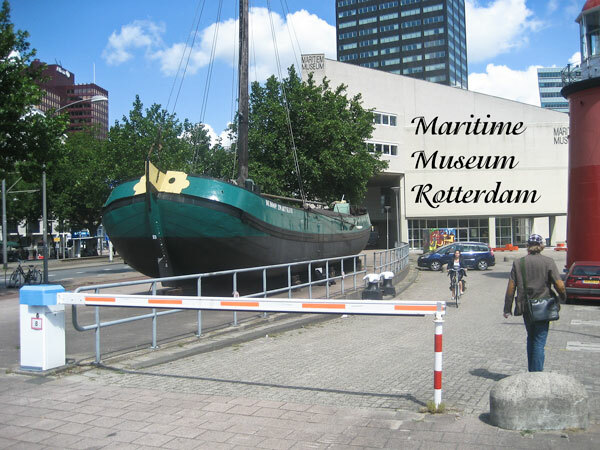 24th June: Rotterdam, the home port of the Eendract, is one fantastic place for ships, boats and maritime activity. There is constant portal traffic as boats, barges, ships, water taxis, cruisers, pleasure boats come and go in a frenzy of movement on the water. 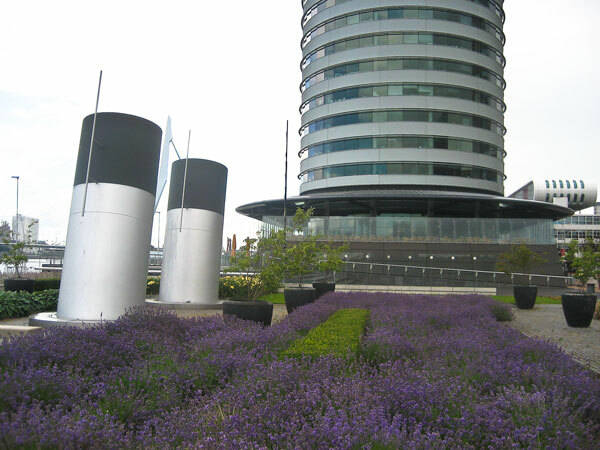 Even on the quayside and in the streets there are constant reminders of the importance of Rotterdam as one of the prime world ports. Everywhere you go there are symbols, monuments and other artefacts reminding you (if that was needed) of the maritime heritage of the City. 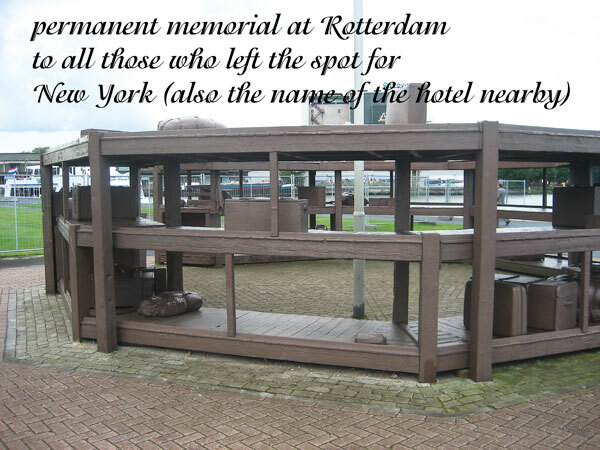 Even the hotels reflect this tradition: the Maritime Hotel, for example, on the quayside, has models of evey description and photographs throughout of ships of all sizes and there is hardly a room in the place that doesn't have some maritime theme. A great recognition indeed for a great maritime port. 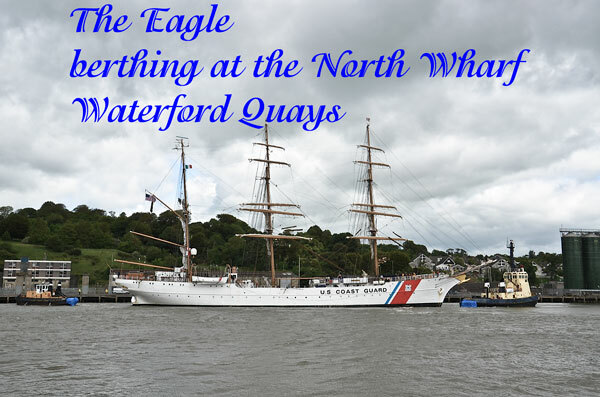 27 May 2011: The US Coastguard Tall Ship, The Eagle, arrived in Waterford today (26th May). 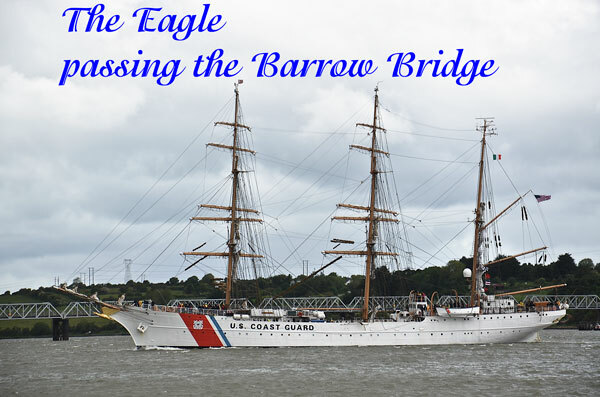 The Eagle is the largest tall ship flying the Stars and Stripes and the only active sailing square-rigger in U.S. government service. It is a 295-foot, three-masted barque, with more than 23,500 square feet of sail and six miles of rigging. This year it celebrates the ship's 75th anniversary of its construction in Hamburg, Germany, in 1936, and is undertaking a European tour. Waterford was it first port of call after nearly three week sailing across the Atlantic. 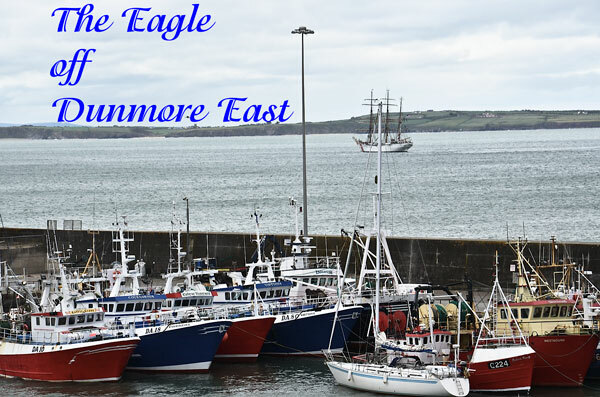 After stopping in Ireland, the Eagle is scheduled to arrive in Hamburg, Germany, on June 3; London on June 10th; Reykjavik, Iceland on June 24 before heading back to the US. 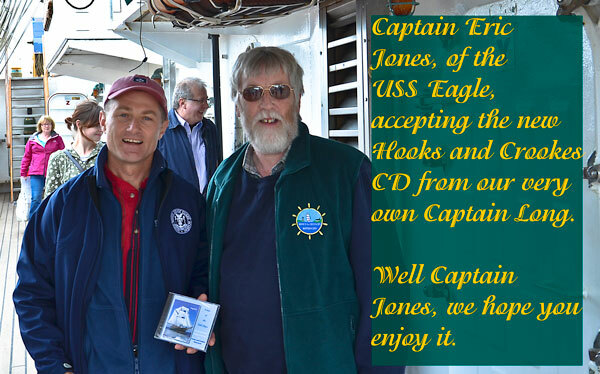 The captain of the Hooks and Crookes crew has being tracking the voyage of the Eagle as it crossed the Atlantic and has being giving regular twitter updates. The same crew member had nothing better to do this morning than to take photographs with his fancy new SLR (see below) as it sailed up the channel into its berth on the Frank Cassin Wharf at lunchtime. The Eagle will be open to the public for free and tours are: Friday from 1 p.m. until 7 p.m., and Saturday and Sunday from 10 a.m. until 7 p.m.
Our intrepid Captain Long went back again that night to photograph the ship at night, and despite the harsh northwesterly blowing down the river, he photographed The Eagle in all her night-time glory. And sure why not visit her in broad daylight during one of the public viewings.It so happened that Captain Long bumped into the Captain of The Eagle, Captain Eric Jones, to whom he presented our latest CD of shanties and sea songs, and which we will sing to the masses when the Tall Ships arrive in a few weeks. What a pity it is the The Eagle will not be among them (she was last here in 2005). 22 April: The Brendan: With the imminent arrival of the Tall Ships to Waterford, it is pertinent to think of the former function of these fantastic ships, which was to sail back and forth across the Atlantic, carrying crew, cargoes and people. But think too of Tim Severin who stitched 49 ox hides together and stretched them over a wooden frame. Then with a gallant crew of four he set sail from the west coast of Ireland in May 1976 and reached Newfoundland two months later. This confirmed the legend of The Brendan, e.g. 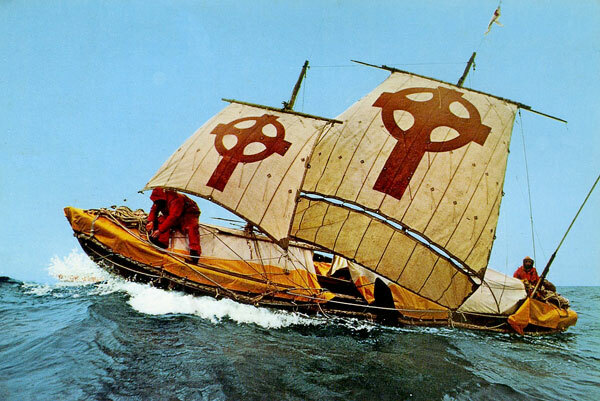 that it was possible to sail the Atlantic in a leather boat, as had been suggested for St Brendan who, with a crew of 17, reached the Promised Land with a leather currach in the sixth century and returned home safely. Tall Ships, or should it be Small Ships, indeed. 8th April: Halls has a new banner to promote the Tall Ships. The last one ripped apart a few weeks ago in high winds. 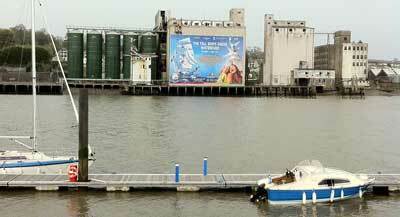 And sure isn't Halls on the north wharf on the far side of the river an ideal place for such a promotional banner. There for all to see, big and bright, and with an important message. 7th April: Richard Sibley: takes contemporary photographs of Tall Ships and he has an excellent website at tallshipsgallery.co.uk. He will be in Waterford City (in City Square) from the 22nd April-1st May and he will be back again for the Tall Ship at the end of June. So if you want to peruse, and even purchase, superb images of Tall Ships and their environment, then drop along to see Richard and his portfolio. He'll be more than pleased if you mention us to him. 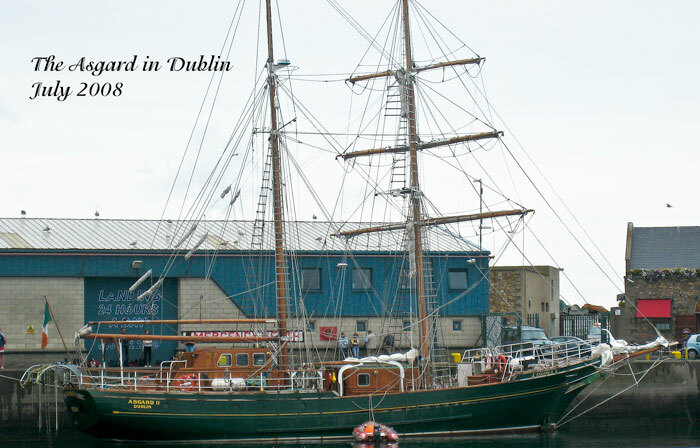 28th March: An important Tall Ships Workshop, was held last Saturday 26th March 2011 in the offices of the Dublin Port Company in Dublin, the aim of which was to discuss sail training in Ireland, or rather the lack of it due to the loss of the Asgard and the Lord Rank. The meeting was opened by the Lord Mayor of Dublin (and Admiral of the Port of Dublin) and our own Des Whelan (Chairman of the Tall Ships Committee in Waterford) made a presentation. A wide ranging discussion followed on the many benefits accruing from having a Sail Training programme in Ireland and the role of Tall Ships in sail training. 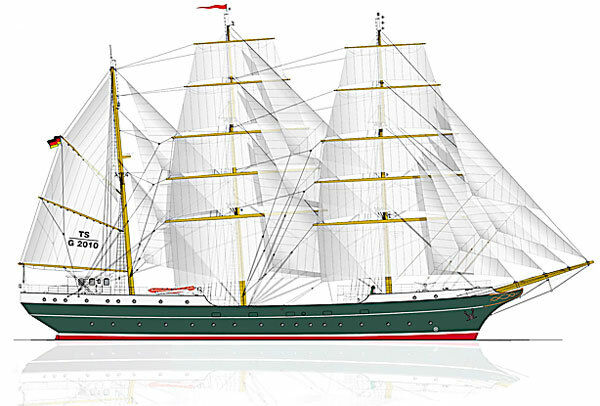 The need for an Irish sail training vessel was also discussed and even a name was suggested Spirit of Ireland (by Jimmy Tyrell, of the Arklow boatbuilding company that crafted the Asgard II). Another meeting will be held in Belfast in April. 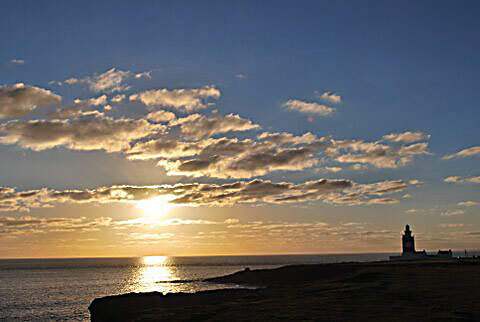 28th March: Fancy a walk in a beautiful coastal setting, with the wind sailing through your nostrils and the sea air rolling around your ears. Well have a look at www.independent.ie/travel/inside-ireland/walk-of-the-week-dunmore-east-to-portally-co-waterford-2585698.html where such a walk is described. 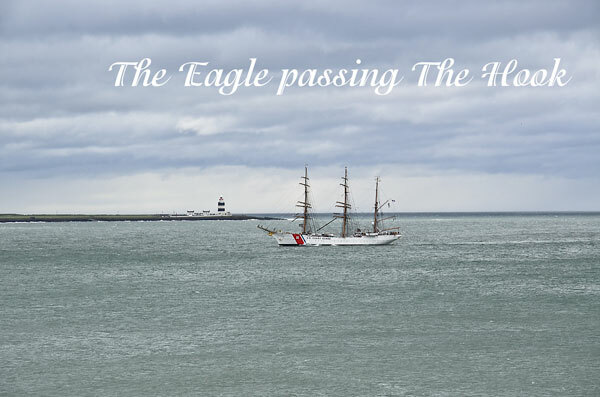 21st March: The American Tall Ship, The Eagle, is leaving Pennsiyvannia on 21st March on her 75th Anniversary Voyage (www.philly.com/philly/news/pennsylvania/118287474.html) and she will visit Waterford on her journey (in May). 23 January: Whales are back off the Waterford and Wexford coasts for the last few weeks and two hardy whale-watchers went in search of them off Hook Head last week. 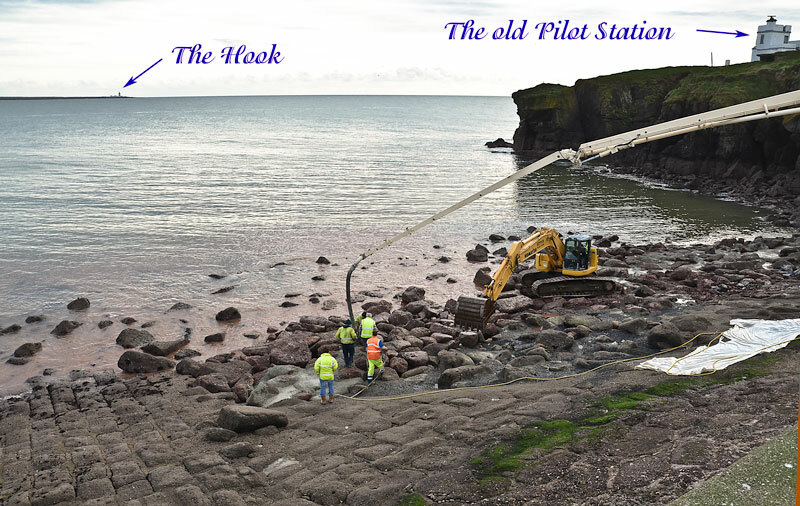 Unfortunately the whales heard they were coming and cleared off elsewhere so the two prominent crew members had to make do with the ambience and charm of the Hook on a bright crisp day. Needless to say one esteemed crew member forgot his camera so we can't show you the one who didn't. For the record, five fin whales and one humpback were seen between Brownstown Head and Dunmore East on the 21st January. 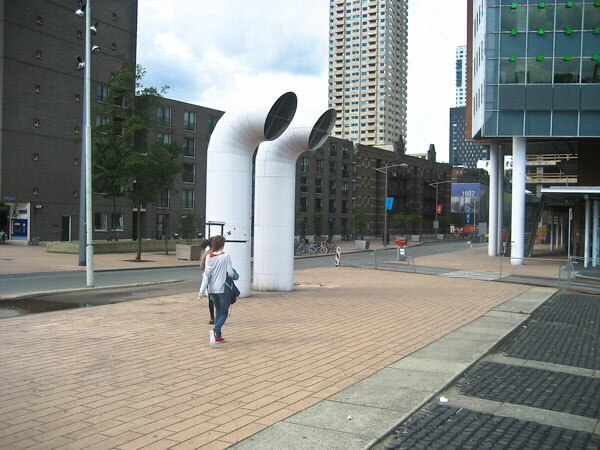 9th January: The Irish fog horn is silenced (or soon will be). On the 24th September 2010, the Commissioner of Irish Lights gave notice (by order of S.G.R. Ruttle, Chief Executive) that the fog signals at Irish Lighthouses would be permanently discontinued on or around the 11th January 2011. So Hook Head Lighthouse (the nearest one to us here in Waterford) will no longer tell us when the seas off the Hook are covered in fog.